Online ordering for unit Adventure Card coordinators is now open (see below)! Cards available starting in mid-March. Sales ends June 14, 2019. In the spring, the Cradle of Liberty Council provides units a fundraising opportunity through the Adventure Card Program. 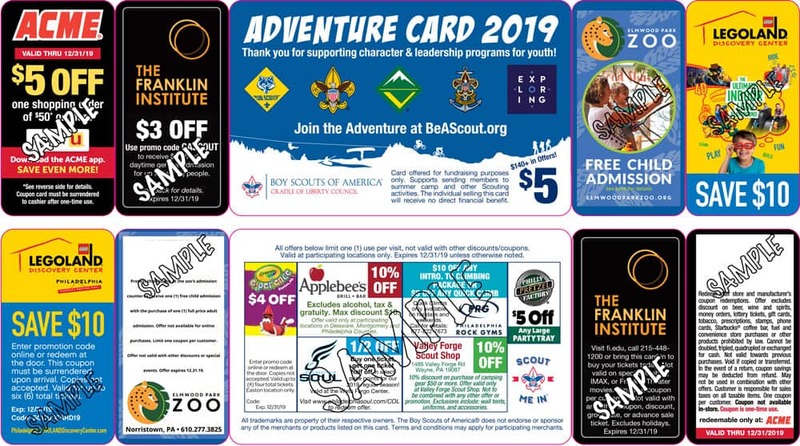 The Adventure Card is a discount card to local businesses that Scout and Exploring units sell to help raise money to attend summer camp and other programs. To date, Scouting units in Cradle of Liberty earned close to $600,000 for these purposes! – Great Value: Cards sell for only $5 and have a value of over $140 with multiple single-use and multi-use deals! – Minimal Risk & Great Return for Units (new for 2019—two options): Your unit will receive a 50% commission on each card sold with no money due upfront (risk-free option) OR your unit may pre-purchase cards and get a 60% commission! – Great Time to Sell: Program runs from mid-March until June 14. – Provides Experience: Scouts can learn sales, money management, planning, and goal-setting. – Enables units to ensure all Scouts & Explorers have the opportunity to attend camp and participate in other great activities! 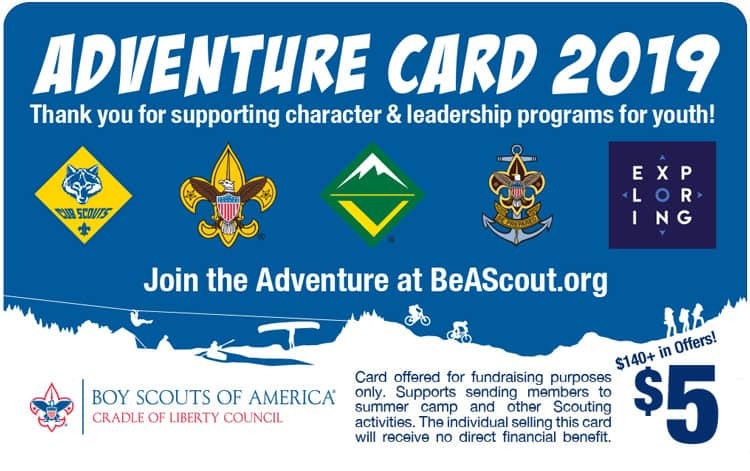 Inquiries about the Adventure Card Program can be directed to your district’s volunteer Camp Card Coordinator, your district professional staff member, or to adventurecard@colbsa.org. A contact list is below. Units: Order Your Cards Today! Obtaining these cards must be done on behalf of a Scouting or Exploring unit—no exceptions. Cards are offered for fundraising purposes only and support sending members to summer camp and other activities. The individuals selling these cards will receive no direct financial benefit. Cards must be ordered in multiples of 25 cards up to 500 cards per transaction for both risk-free and pre-purchase options. If cards are ordered using the risk-free option, money due to the council ($2.50 per card) must be submitted prior to making another risk-free order. Two different card versions, two options to order cards! 1. Pre-Purchase/60% Unit Commission (new for 2019): Units that pay for cards up-front receive a 60% commission—that’s an extra $0.50 per card! This is great option if your unit sells a consistent number of cards each year. No need to settle-up later. Not returnable/refundable. Payments may be made online through this registration (no processing fees!) or units can authorize the payment from their custodial accounts. 2. Risk-Free/50% Unit Commission: Order cards with no payment required up-front and your unit receives a 50% commission for each card sold. Your unit will be able to order additional cards after payment for the initial order is received ($2.50 per card). Any unsold cards may be returned (undamaged with no tabs removed) no later than June 14, 2019. Units that return 40% or more of their order will not be eligible to participate in future council-sponsored fundraisers. You’ll have the option to select to pick-up the cards locally or from the Council Resource Center in Wayne. Local district distribution locations will be posted on this site. Cards will be available beginning the week of March 18, 2019. Can’t pick-up that week? That’s OK! The sale ends June 14, so your unit has plenty of time for a successful sale! Order using the button above and we’ll have your cards pre-sorted, as long as you submit your order 48 hours in advance of pick-up. Unit coordinators can use the online order form throughout the fundraiser to order more cards (please remember, if your unit ordered using the risk free option, the money due to the council ($2.50 per card) must be submitted before you can get more). Pick the location most convenient. If you are planning on picking-up at a location listed for another district, please send an email to adventurecard@colbsa.org to let us know. Cards can also be picked-up and money submitted at the Firestone Scouting Resource Center (council office) in Wayne during normal business hours. You may also make arrangements with your district coordinator or professional if that’s more convenient. – Franklin Institute: $3 off adult daytime general admission for up to four (4) people. – Elmwood Park Zoo: One (1) free child admission with the purchase of one (1) full price adult admission. – LEGOLAND® Discovery Center Philadelphia: Save $10 on up to six (6) total tickets. – Applebee’s Grill+Bar: 10% off (excludes alcohol, tax, and gratuity. Max. discount is $10). – Crayola Experience: $4 off up to (4) total tickets. – Philadelphia Rock Gyms: $10 off any Introduction to Climbing Package OR $5 off any Quick Climb Package. – Philadelphia Soul: Buy one ticket, get one ticket half off. – Valley Forge Scout Shop: 10% discount of purchase of camping gear $50 or more. Total value of more than $140! All offers limit one (1) use per visit, not valid with other discounts/coupons. Valid at participating locations only. Expires 12/31/19. For every 25 Adventure Cards an individual youth member sells, he or she can be entered into one of the weekly drawings for $25 Amazon gift cards. Drawings are held on Thursdays and will have five winners each. All entries from the weekly drawings will then be put into a Super Drawing at the end of the sale for even larger prizes. To enter into a weekly drawing, youth members sell at least 25 Adventure Cards and submit the money collected to your unit coordinator. Unit coordinators will turn in the names of qualifiers to their district Adventure Card team or at the Firestone Scouting Resource Center in Wayne. Payment must be included if your unit ordered using the risk-free option (unit keeps the 50% commission). Unit coordinators will turn the coupons (or write the names of qualifiers on the card/money transfer form at the time of the transaction) and payments to their district Adventure Card team or at the Firestone Scouting Resource Center in Wayne. Scouts can be entered for every 25 cards they sell and can enter multiple times each week. Entries are due to the Cradle of Liberty Council office by Wednesdays at 5 PM to be considered for the Thursday drawings. Entries received after Wednesdays at 5 PM will be included in the drawing the following week. The first 2019 drawing will be held on April 4 and the last will be on May 30. Cards for winning youth will be sent certified mail to the unit Adventure Card coordinator. This weekly newsletter, which will be distributed each week through the fundraiser, is intended to be a resource for unit coordinators to help your sale be as successful as possible. Make sure to select the “**Adventure Card Fundraiser” email list in order to get the newsletter. Through a partnership with SEPTA, our Scouts are able to sell at a select number of SEPTA stations in our area, listed below, through May 31. 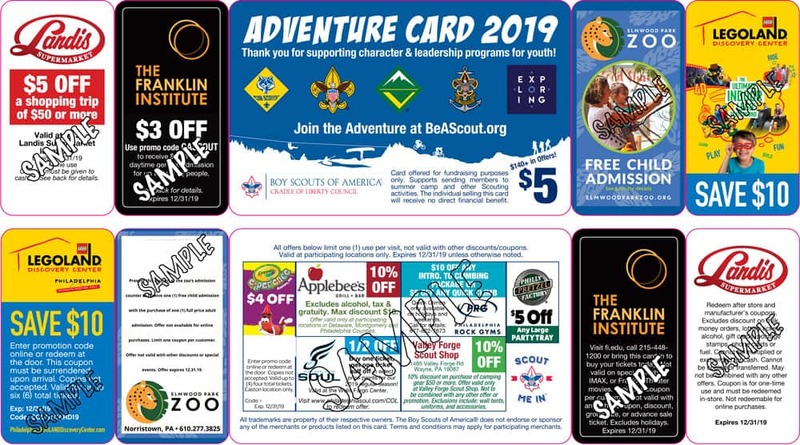 If your unit would like to sell Adventure Cards at one of these locations, please email your request to adventurecard@colbsa.org with the date(s) and station(s) you are requesting. If approved (the date/location is not already spoken for) you will receive a copy of the SEPTA permit that must be displayed while Scouts are selling. All weekdays are available from 3-7pm, all Saturdays and Sundays the stations are available from 11am – 4pm. Scouts should be in Scout uniform, under adult supervision at all times, and must obey all requests from SEPTA and other location personnel. Where and how Scouts sell Adventure Cards is really only limited by the imagination. In past sales Scouts have sold in all sorts of locations. Brainstorm some ideas with your leaders and Scouts, using the list below to get started! Sell the Scouting Experience, not the discounts on the card! *As part of the agreement with the vendors listed on the card, DO NOT sell at any of those locations. – Use spreadsheet available under the forms & resources section to track the cards issues and returned by each of your Scouts. – Have each Scout set a goal and relate it to their summer camp costs. Use visual charts to track each Scouts’ progress and inspire competition. – Set unit Adventure Card calendar with distribution dates, unit sale events, and date for Scouts to return cards and money to the unit coordinator. – Check-in weekly with all Scouts by collecting money for sold cards and issuing/moving cards as necessary. Keep track of the unit’s overall progress including cards sold and cards with each Scout. – Regularly turn in your Strive for 25 entries and money for sold cards at one of our collection locations or at the Firestone Scouting Resource Center. 1. Always sell with other youth and adults, never by yourself. 2. Never sell after dark, unless you are with an adult. 3. Never enter anyone’s home, even if invited. 4. Don’t carry large amounts of cash on you. Frequently give your money to your parent or guardian and regularly turn in money collected for sold cards to your unit leader (along with Strive for 25 entries that you’ve earned). 5. Always walk on the sidewalk or driveway. 6. Carry your cell phone and make sure it is charged. The Boy Scouts of America has recently released additional guidance on unit fundraisers and the use of “Scout Accounts” (individual accounts held by the unit with amounts set aside for each Scout). All unit leaders are encouraged to review the information below regarding these new clarifications of these guidelines and policies. – “BSA offers guidance on individual Scout accounts” – Bryan on Scouting, Scouting Magazine 12/3/14. – “BSA Product Sales Guide” – Updated August 2014, Sections include Camp/Discount Cards (pg. 7) and Individual Youth Accounts (pg. 9). – “How to Handle Fundraising Dollars” – CubCast 12/2014. Includes interview from Steve McGowan, General Counsel for the Boy Scouts of America.